Ten years king, Malcolm sits on an uneasy throne. 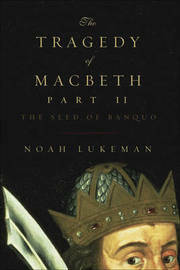 If Malcolm's mind is haunted by the ghosts of his royal father ("gracious Duncan") as well as the thane and lady who so bloodily betrayed him, Malcolm's soul is sickened, as was Macbeth's, by the witches' prophecy that from Banquo's seed would spring a line of Scottish kings: a prophecy that remained unfulfilled at the end of Shakespeare's play. The witches also taunt Malcolm with riddles all his own: that sorrows will visit him from Ireland (where his younger brother fled upon their father's death); that his love for Macbeth will breed fresh treachery. True to the Shakespearean model, its devious plot unfolding in five acts and its speech set to the measure of blank verse, Macbeth, Part II, draws bold the tragedy of a powerful man undone by the terrors he imagines and the truths he fails to see.